I love making the old-fashioned damper because it’s so easy to make. It literally takes three minutes to mix, and throw into the oven. It’s best served warm with lots of butter. I never add jam to it but you can add whatever pleases your palate. You can vary this basic recipe by adding chopped herbs, cheese, onion, nuts or even mixed dried fruit. I hope you’re having a great weekend. Ours, started warm and sunny, but now, it’s rather cold and chilly. I wish you a lovely week. Extra milk and flour for brushing and dusting. Preheat the oven to 360ºF (220ºC) 10 minutes before baking. Line a baking sheet with parchment and sprinkle with some cornmeal (maize flour). Sift or whisk the flour, baking powder, salt and sugar, into a bowl. Make a well into the centre. 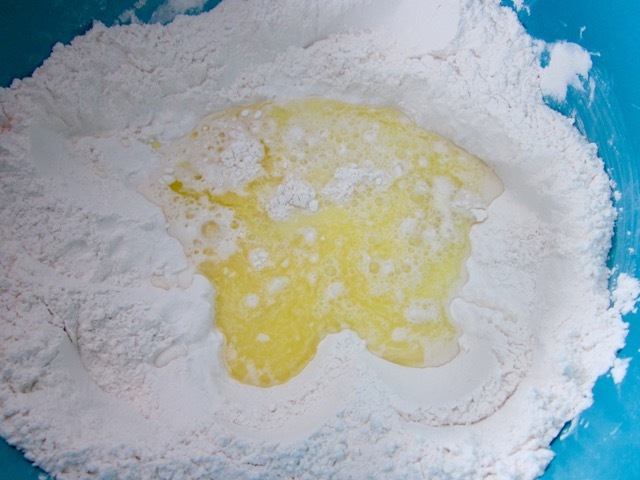 Add the butter, milk and ½ cup water into the well and mix briefly and lightly into a soft and slightly sticky dough, adding the remaining water only if necessary. 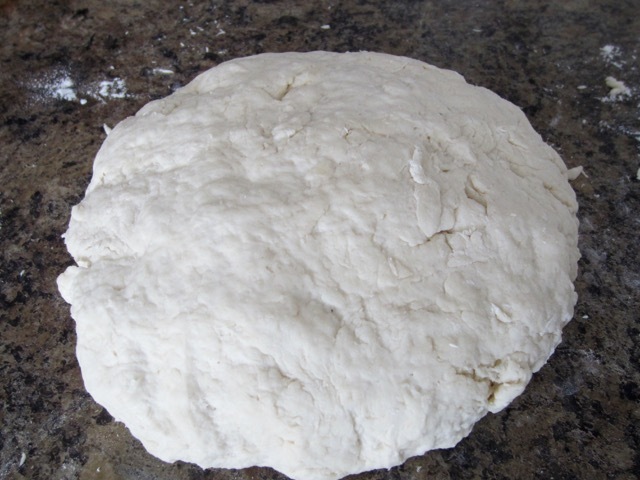 Turn the dough onto a lightly floured surface, knead briefly for 30 seconds and form into a 7 ½-inch round bread (don’t over handle the dough). Mark the bread into 6 wedges using the blunt side of a table knife. Place on the prepared tray, and brush with milk and sprinkle a little flour. Bake 50 minutes at 360ºF (180ºC) or until golden.Transfer to a cooling rack and wrap immediately with a kitchen towel to keep it soft. Preheat the oven to 360ºF (220ºC) 10 minutes before baking. Line a baking sheet with parchment and sprinkle with some cornmeal (maize flour). 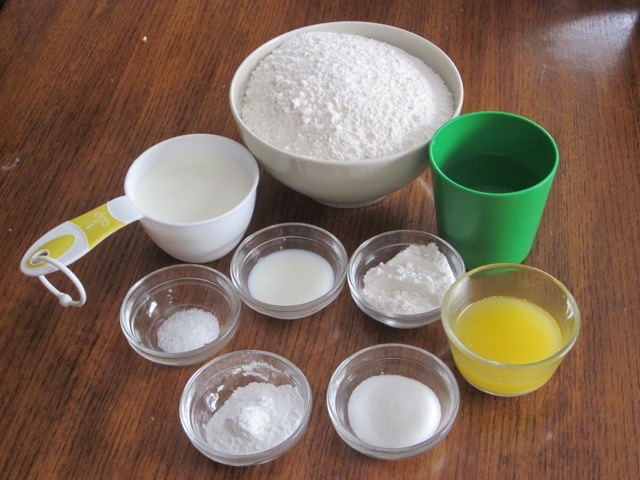 Sift or whisk the flour, baking powder, salt and sugar, into a bowl, Make a well into the centre. 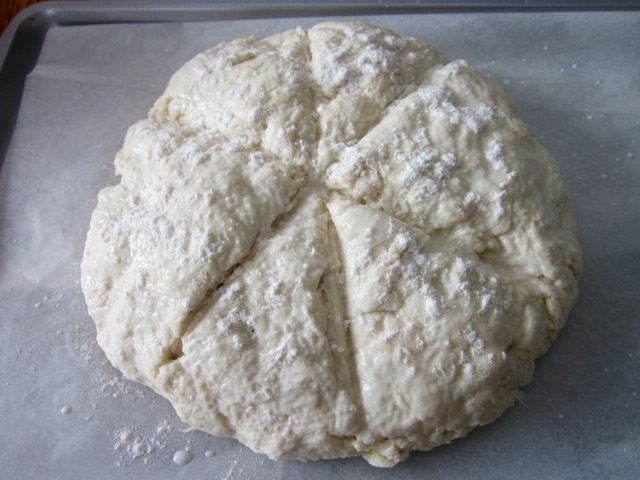 Add the butter, milk and ½ cup water into the well and mix briefly and lightly into a soft and slightly sticky dough, adding the remaining water only if necessary. Turn the dough onto a lightly floured surface, knead briefly for 30 seconds and form into a 7 ½-inch round bread (don’t over handle the dough). Mark the bread into 6 wedges using the blunt side of a table knife. Place on the prepared tray, and brush with milk and sprinkle a little flour. Bake 50 minutes at 360ºF (180ºC) or until golden. Transfer to a cooling rack and wrap immediately with a kitchen towel to keep it soft. Serve warm. I always weigh ingredients, especially the flour and butter. You can use cup measures, but please note if you scoop flour directly from the bag you will end up with 150-185 g of flour instead of the recommended 125g. I suggest you spoon the flour into the cup, heaping it up over the top, then slide a knife across the top to level off the extra. Be careful not to shake or tap the cup to settle down the flour or you will have more than you need. Takes only 5 minutes to mix and throw in the oven. Give it a go, sometime! Good luck! Just look marvelous and fairly simple! I’m planning to give it a try! Thanks. Happy trying and pleasant week to you! And to you. I am preparing to make some strawberry jam and this will be just perfect with it! Oh how nice. I’ve never made homemade jam. Been procrastinating all my life. Maybe one day it will happen! Thanks. Another bread I’ve never heard of and must try soon. It looks great and love how easy it is. Warm with lots of butter sounds great, though I would probably slather on plenty of homemade jam too. I need to make more things to spread jam on since I founds LOTS of jars of homemade jam in the pantry move! Oh you should send me some of those jams by virtual post. I could do with some homemade jam. It’s always such a pleasure to eat. The bread tastes nice and my son really loves it. Enjoy the rest of the week. We’re bracing ourselves for some really cold weather, sometime this week. This is my kind of bread! I must give it a go. Hey Lisa how are you? I’ve been admiring all that lovely food you cook. Happy baking and have a lovely week! I’m good Liz thank you. Are you? Thank you. Have a great week yourself! Glad to hear it Liz! Australian. Used to be made over hot coal fires, so that is close to your description of a damper “something to raise or lower heat of fire”. It taste really nice so please plan to make it. Have a lovely week, my dear and thanks for visiting! Me too. I love learning new and old things too. Just found this (I’m endlessly curious..) “Origins – – Our research has suggested that the earliest records exist from the unleavened bread (of which Damper Bread is) was made by Australian stockmen who didn’t have time to wait for their bread to rise after a long day on the trail. Oh thanks so much for the information and the link. 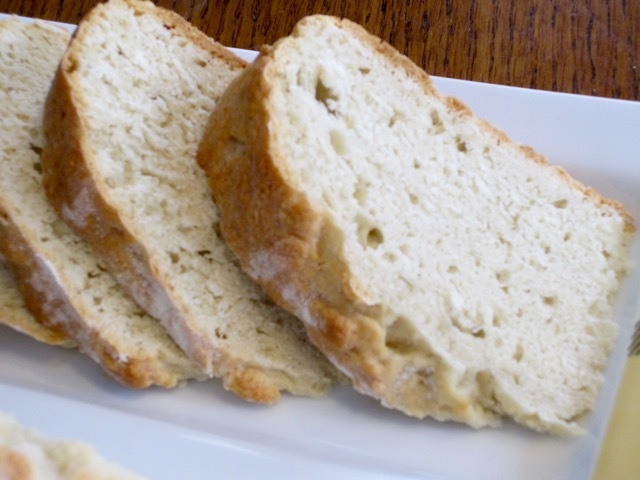 This bread is really quick to make and tasty too. Now I know why it’s called a damper. Have a great week! 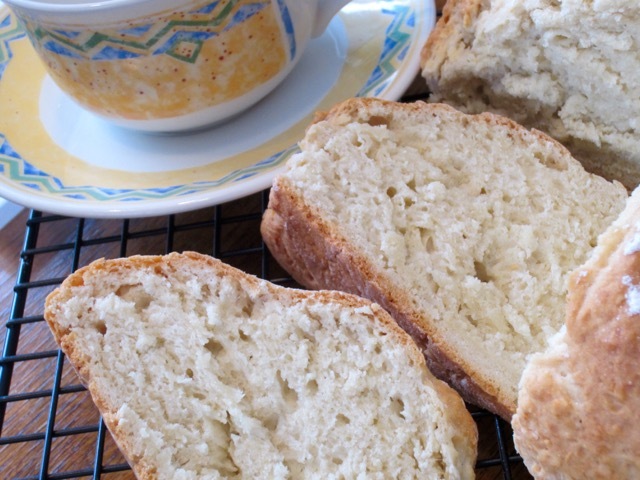 Ah, lovely bread…you have a lovely week also.! 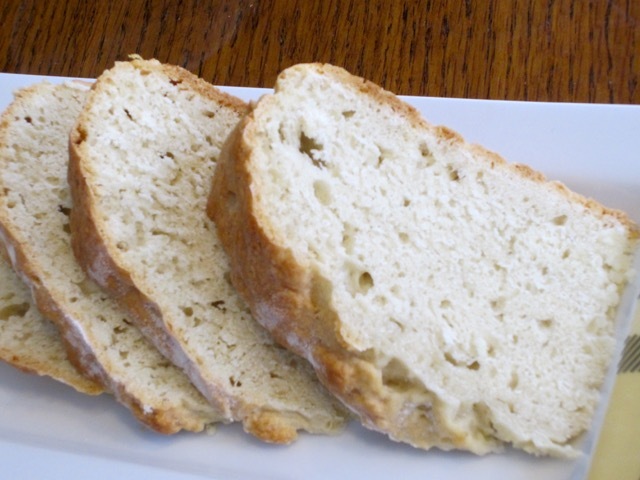 Very interesting recipe – would be good when a last-minute bread is needed for a meal. I usually throw together a cornbread for such occasions, but the bread looks more tempting to me right now! It tastes really good. You should try it sometime. That looks so delicious! Warm bread is just the best! Delicious and easy to make. Have a great week! Lucky you, wallowing in the sunshine. This week the temperatures are going to dip…low down to -21C. What a disruption to the nice, mild winter we’ve have been enjoying. I hope it won’t last longer than the 4-5 days, forecast. I really admire those outdoor ovens. Great for pizza and breads like the damper, unfortunately, I don’t have one. Have a wonderful week. I’m soon heading to dreamland. Thanks! I have been aware of the winter in Canada. I have cousins in N.S. And also sister and mom in and near Brockville so they happily keep me up on the weather there, trying to make me feel bad about my winter probably! Not working! I think I’m in love with this chicken recipe. I’m like you, I don’t eat much beef and I’m finding I do eat mostly chicken, pork and some seafoods. When I get home I will send you a recipe I picked up here in Adelaide Hills. it’s a salad. Have you heard of Freekah? It’s a type of grain and is in this recipe with carrots for the salad. I’d never heard of it before. Have a great day. I’m having to piggy back off my cellular and it’s not the best out here! I’ve never heard of Freekah but I’ve just googled and pleasantly found out it’s just green roasted wheat. I wonder what it tastes like. I look forward to the recipe, of course. Have a nice day. You’re just starting the day? Best wishes! This is exactly what we need to serve with our gumbo tonight. Thanks. Also, you know I love the fact that it was originally intended to cooked over a fire. Gonna have to try that! I could do with a plate of hot steaming gumbo. I still have a quarter right here on the table…some virtual serving please. Extra large serving. Have a great week! A big bowl for you! With rice and Tabasco! Oh boy thanks, just getting ready to watch Super Bowl. A big bowl, rice and Tabasco for Super Bowl. What a coincidence! I’ve never heard of this bread, but it looks wonderful and I’ll have to try it. 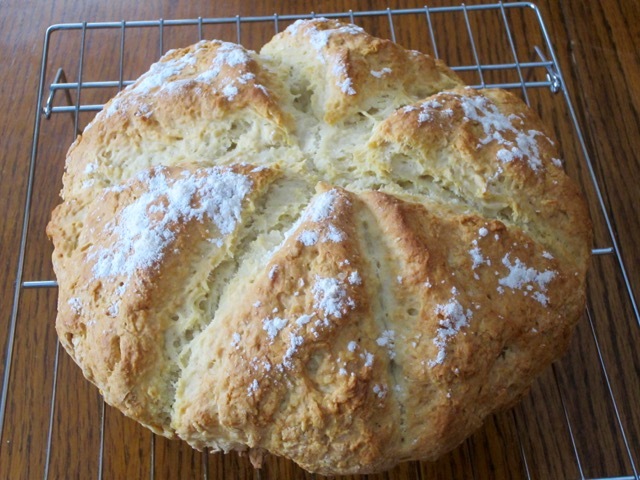 I thought maybe it would be like soda bread, but there’s baking powder instead of soda, so I guess it’s something else. It looks more moist than the soda bread I’ve tried. I’m going to look it up on the web right now. It’s an Australian bread. Used to be made over open coal fire. 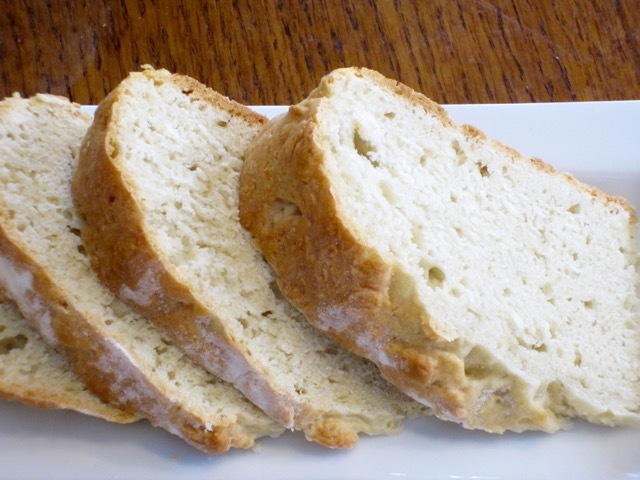 I also have the recipe for Soda Bread and this one is very moist. I love both because they are easy to make. You should wrap it up in a kitchen towel immediately after removing from the oven, then it doesn’t dry up too much. I hope you find time to try it. Best wishes! I love seeing your bread posts. I love bread! I love bread. I’m eating a chunk of it right now…. Ha ha no slicing since it’s still warm. Just tear off a piece and there you are…. a large virtual chunk for you. Enjoy!!!! I think it tasted good. Thumbs up to the cook! I don’t know…. It is bread! 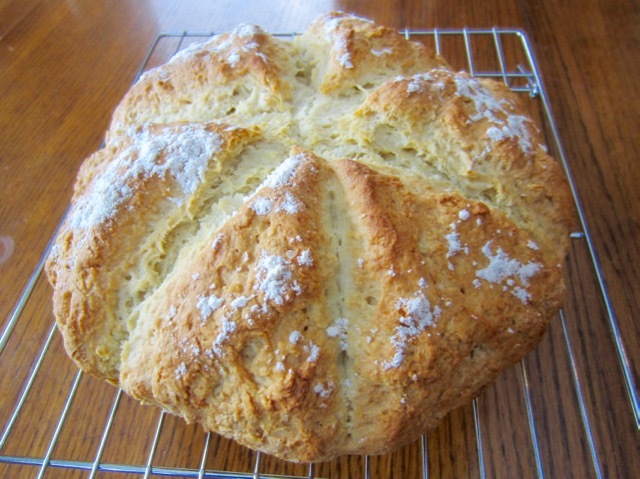 Oh yeah it does taste more like the Irish Soda Bread, made with of buttermilk and baking soda.